One thing children love when eating or drinking is fun, colourful cups, plates, bowls covered in their favourite characters. My two are no exception so when we were sent some of the new Disney range from Munchkin, I had one very happy little boy. We received the Mickey Mouse range and the first thing Mister B had is eye on was the drinks bottle. It is a slightly narrower bottle than the one he is currently using which I actually like as I find a lot of drinks bottles quite chunky for little fingers. And the big bonus I found with it was in the car where it sat perfectly in his car seat drinks holder! The top of the bottle has a flip out straw which was Mister B loves although the slide over lid to open the straw is a little stiff and he does require some assistance to do this – I’m hoping he’ll get used to it over the next few days so can manage it himself. Something that really appeals to me is the ‘click’ to lock technology when screwing the lid on the bottle which provides it with a 100% leak proof guarantee – I’m constantly having leaking bottles in my bag and so far this one has proved leak free!! We also tried out the dining set which consists of a plate, bowl, fork and spoon. I love the plate – it has lovely bright, colourful Mickey Mouse images and the background is blue – Mister B’s favourite colour (as he reminds me about ten times each day!!). The plate is divided into three sections which I think all children love. We have used this every lunchtime and Mister B loves his tomato and cheese in the little compartments or at dinnertime he has his veg in them. 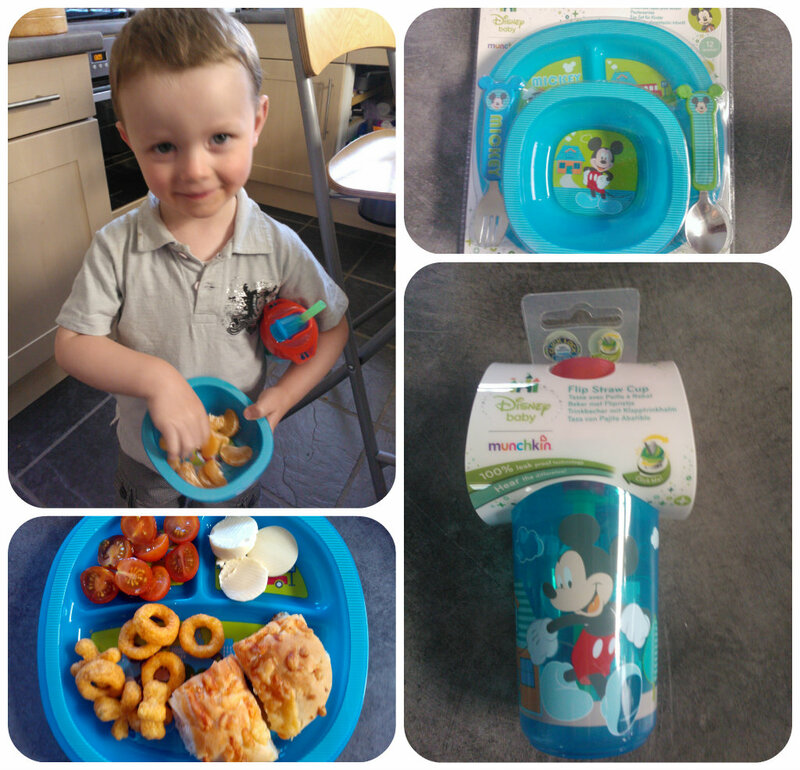 The Mickey Mouse bowl is the ideal size for snacks and a firm favourite of Mister B’s to use. The plate and bowl both feature a non-slip grippy base to help them stay in place on the table during use which is perfect for little ones. There is also a fork and spoon with Mickey Mouse shaped ends. Mister B found these really fun and although he’s a bit reluctant to use a fork usually, with his new Mickey Mouse cutlery he has had a few goes with both the spoon and fork. Overall I found the Mickey Mouse dining set from Munchkin to be of high quality and well made. I love the designs and images on the pieces and they are perfect for young children. All the items included have been a hit with Mister B which I think is the true test as he can be very stubborn and if he doesn’t like something, he won’t use it! The Disney range by Munchkin not only includes Mickey Mouse, but Minnie Mouse, Winnie the Pooh and Monsters so there is something for everyone. They start priced at £4.50 and for more information visit the Munchkin website. This entry was posted in Reviews and tagged dining set, disney, flip straw cup, mickey mouse, munchkin by Fiona Martin. Bookmark the permalink. They do look really sweet. My lads ould have loved them a few years ago, and as you say, it’s got to be a good thing that the drinks bottles have a click lock functionality! Great review. They look well made and my daughter loves Mickey Mouse, so might have to get them. Nice review, a must have for my son. I recently purchased him a set of plates, when out of packaging they were bendy and cracked within a week.